Even if you haven’t read Stephen King’s novel or seen the 1989 movie based on it, you’re likely familiar with the story of PET SEMATARY. A family moves to a new home in the countryside, where they discover a cemetery in the woods where children bury their pets … and they sometimes come back. But when they do, they aren’t quite the same. When tragedy strikes the family, the father’s ability to cope with the loss is challenged by the knowledge of the cemetery’s supernatural powers. King’s classic story is unearthed in the new PET SEMATARY, opening on April 5. The film features a fantastic cast that demonstrates how great actors — and performances — can make a horror story even more terrifying. 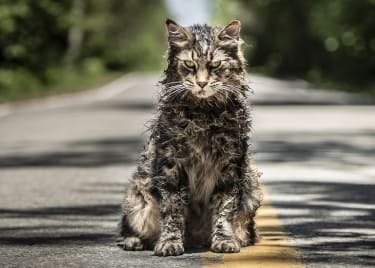 Jason Clarke anchors the PET SEMATARY cast as Louis Creed. We’ve talked about his bonafides before, but a quick refresher: He’s been in films of every stripe, from ZERO DARK THIRTY to THE GREAT GATSBY, TERMINATOR GENISYS and DAWN OF THE PLANET OF THE APES. He’s a powerful figure on screen and an authoritative presence. Stephen King’s story gives Clarke a chance to channel some of his darker impulses into a performance that layers shocks with real, heavy emotions. Some of the film’s most emotional (and terrifying) moments rest on Clarke’s shoulders, and he handles them beautifully, giving one of the best performances of his career. Horror doesn’t have to be merely jump-scare cinema — it can be an environment for actors to access pure, intense emotions that don’t always have a place in straight dramas. Playing opposite Jason Clarke is Amy Seimetz as Rachel Creed. The maternal role can be a thankless one in horror — it’s the character who has to shepherd people to safety and issue warnings about how “you’ll get possessed if you go near that ghost” or “that creepy clown will eat you,” but never gets to engage in the fun stuff. 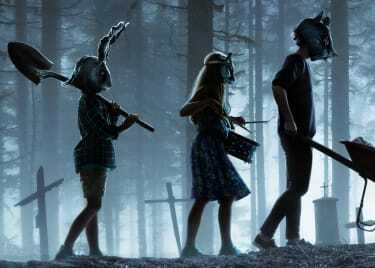 Like other standout horror films such as HEREDITARY and THE BABADOOK, PET SEMATARY has more to offer. When Rachel was young, her older sister died following a battle with a horrible illness that left her a shell of her former self. Rachel is still traumatized by this loss, which makes it difficult for her to cope with death. Since death is kind of a huge deal in this story, Seimetz gets to deliver some of the most relatable moments in the movie. Her character’s history connects the film’s supernatural horror to reality, and Seimetz is such a talented actress that her natural performance emphasizes the horror of the situation all around these characters. Horror is always an act of salesmanship. A film has to convince every audience to believe in whatever scary reality it is building, whether it’s a haunted house or ghost story — or the tale of the recently dead returning to life. The details of the story are always helpful, and Stephen King has spent decades proving he’s got the details on lock, which means PET SEMATARY has a head start on most horror movies. The most important aspect is always the actors, however. It isn’t just that great actors can thrive in horror, where they get a chance to explore the deepest recesses of the experience. It’s that horror can only truly reach its potential with great performances to convince viewers that everything on screen is actually being experienced by someone out there in the dark. PET SEMATARY rises again on April 5. AdventureActionWalt Disney StudiosDramaJ.J. AbramsStar WarsLucas FilmComedyHorrorWarner Bros.
Browse more movies at an AMC near you.